After our 20ish hour sleeper bus extravaganza from Hoi An (amazing place!) 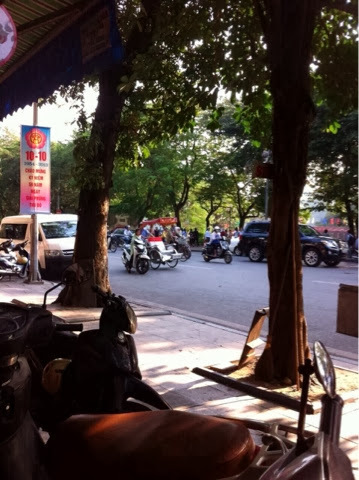 to Hanoi, we finally arrived around 8am. We had booked into the Hanoi Hostel which was basically a travel agency with a few dorm rooms upstairs. The rooms are all 8 beds, which is fine by us. This time of year in SE Asia is low season, so reeeally quiet, so we only had one other girl in with us who didn't arrive until around 11pm. The room was cheap, no more than $5 per night each and relatively clean. I'll admit, it isn't the cleanest or nicest place we have stayed but it had A/C, clean sheets and lockable cupboards under the bunks for your bags and valuables which is all that is important in my eyes (I feel like a changed woman - who'd have thought 6 months ago these would be my requirements for a trip away - normally swimming pools with a swim-up bar or a lot more my thing). 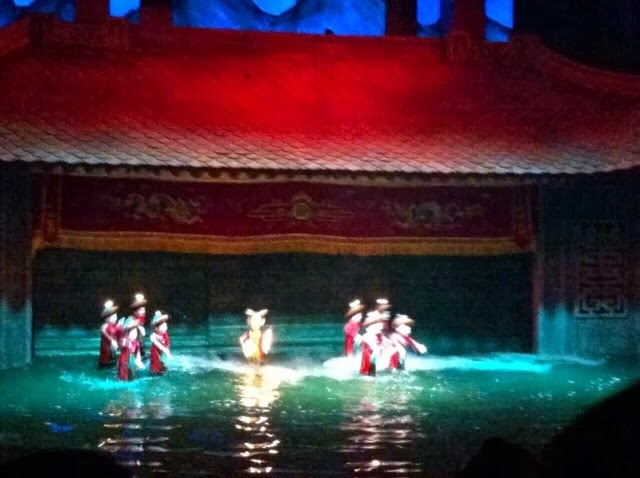 Most people travel to Hanoi for either the famous water puppet shows or as a one night stay before travelling three hours North to the amazing UNESCO site of Halong Bay - we were here for both these reasons (the puppets less so but Luka said her oldest brother recommended not missing out on them!) Halong Bay trips offer one day, two day (one night stay on the boat) or three day (one night on the boat, one night in a beach bungalow of the island) trips. There are three types of boat; economy, superior or deluxe. We opted for the two day, one night stay on the superior boat which cost $74 (USD) each. We were told by our hostel receptionist that the economy boats aren't recommended as they are often found to be dirty with poor service and tour guides who don't speak particularly good English. We booked our tour for the next morning with an 8am pick up; it takes 3-4 hours to travel by bus from Hanoi to Halong Bay so an early start is necessary. 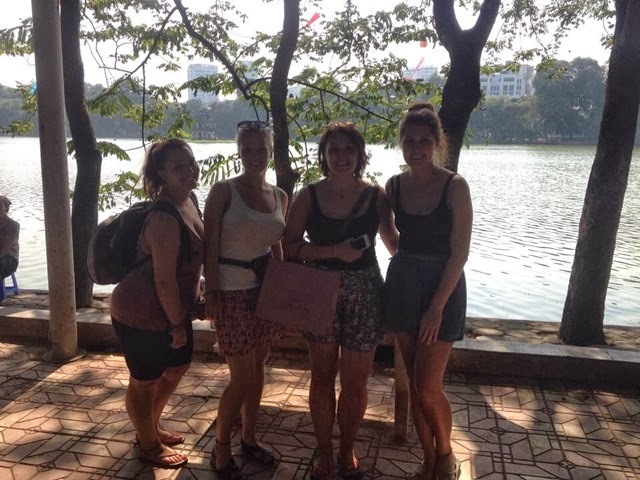 After booking our boat trip, we headed out to see what Hanoi had to offer. As we had driven in, we saw the main area; a lake surrounded by restaurants and shops with balloons in the air and a Japanese pagoda - we decided a little wander round was what we fancied after a few days of none stop travelling and sightseeing. 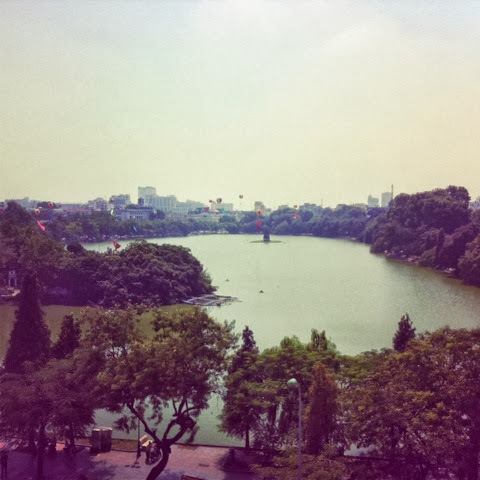 We headed down to City View point to get the the cafe at the very top to get a view of central Hanoi. We spent a full day walking round and booked our Puppet Show tickets for the 8pm showing - the ticket office is on the opposite side of the road to the Japanese Pagoda and has a really good coffee shop next door, The prices are a little steep but they do the most incredible Iced White Chocolate Mocha which, in my opinion, is worth spending that little bit extra on. So, puppet show verdict - erm, interesting. Obviously, the whole thing was in Vietnamese so, at times, it was hard to follow but that made it really amusing. It was actually really clever how they did it all and the show itself is no more than one hour. I would definitely recommend experincing it for yourself as it really is something Hanoi is famous for and the tickets aren't expensive at all; a couple of dollars at the most! After the puppet show, there was the option to go out but you'll find everything in Hanoi normally shuts between 11 and 12 - either by choice or because the police shut everything down. We had a little wander around the shops, which was an experience in itself - every street has a theme - hat street, shoe street etc - really good and they will have everything you would ever require! I think that's the one thing I've found with Asia - you can get the same things everywhere so if you miss out on buying things, chances are, you can about 90% guarantee you'll get it in the next place. I'm a lover of tat and, what we have called, 'holiday fever' buying - things you think you love now but they're either hideous, only appropriate for travellign/backpacking or you just get caught in the moment and will NEVER wear/use/want said thing again. Beware of holiday fever! If you can spot it/avoid it, I promise you will save yourself a lot of money. 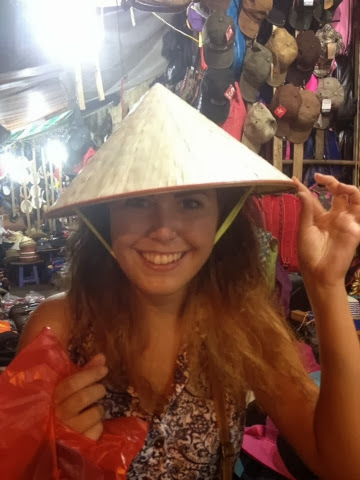 When would I ever need a Vietnamese hat? Is this really practical when backpacking? How did I intend to transport it? It looks bloody stupid. "Oh, it's only a dollar!" - No, no, NO! It's safe to say this made it to Halong Bay and back to Hanoi and was accidentally (fortunately!) forgotten in the our second Hanoi hostel.